Imaging Resource recently published an interview with some Panasonic staff, mostly engineers. The interview was centered around the technology of the Panasonic GH3, their long awaited new top camera model. It is not unusual that new camera models are advertized as having a better dynamic range than previous models. I think that the dynamic range was a shortcoming of both the GH1 and GH2 models, and so I would be very happy to see a significant improvement to the GH3. The engineers were quoted to say that the saturation level of the sensor photosites was 45000 (in theory), but that the actual number would be lower. They also compared this with the fill capacity of typical compact cameras, which is 8000. So, what does this mean? When light hits a pixel, electrons are released, and counted by the sensor. The more electrons released and counted, the lighter tone this photosite will report. When 45000 electrons are released, the pixel is saturated, and cannot report any brighter tone. We have then overexposed the pixel. So we see that there is a theoretical maximum of 16 stops of tones in the dynamic range. Actually, the true number would be 15.5 stops, calculated as log2(45000). However, in practice the number of stops will be much smaller, of course. First of all, the number 45000 was quoted as the theoretical fill capacity. And what the actual fill capacity is was not stated. Second, noise is going to affect this evaluation. Not only due to technical shortcomings, but also due to the physical nature of the light and electrons. For example, it is natural to assume that the electron count is Poisson distributed. This means that the standard deviation in the first two groups, 1 and 2, is 1 electron and the square root of 2 electrons, respectively. Hence, categorizing between the groups 0-2 is going to be almost pure chance only, even with some noise reduction techniques. It is perhaps only group 4 that can be categorized correctly with some reasonable significance. And on top of this comes the extra noise added by the sensor equipment. So how many stops of dynamic range can we expect? It is probably impossible to calculate based on this information only. But if they are correct that 8000 is a figure for point-and-shoot cameras which is comparable to the 45000 figure, then the GH3 can be expected to have 2.5 stops more of dynamic range compared with a point-and-shoot camera, calculated as the difference between log2(45000) and log2(8000). And 2.5 stops improvement over a compact camera does not sound very impressive, honestly. As a side note, the table above explains why some people use the Expose To The Right (ETTR) technique for improved noise performance. This philosophy states that you should expose the subject as much as possible, without losing details in the light parts. The light parts, to the right in a histogram, correspond to the lower part of the table. In this section of the histogram, there are more electrons behind the measurements, hence, it is reasonable to believe that the significance of the tone segment grouping is higher. And this means less noise. Using ETTR will of course give you too bright images, but you can open them later in a RAW editing program, and reduce the brightness, while retaining the good noise performace. ETTR only makes sense when you have less dynamic range in the subject than the sensor can handle, which is perhaps not so often. Many new Micro Four Thirds camera models have been launched stating that they are the quickest in terms of autofocus, and the GH3 is no exception. In the interview, they refer to a 240 frame-per-second mode. This is easily misunderstood. It does not mean that there is a video mode which records video quickly, suitable for making slow motion videos. Rather, it refers to the sample rate used for the Contrast Detection Auto Focus (CDAF) system. The CDAF system relies on sampling the contrast of the subject while changing the focus of the lens. The faster it can sample the contrast, the faster it can reach optimal focus. The GH2 also improved upon the GH1 by having a maximum of 120 fps sample rate, to be compared with 60 fps for the GH1. As I saw in my AF study, this made the GH2 beat the GH1 in bright light. In dim light, however, the GH2 had to revert to a slower sampling rate, and the focus speed of the two was virtually identical. With the GH3, I expect that the 240 fps option will only work in fairly bright light, and that the focus speed gain due to this feature will be limited in dim light. They also stated that using the 240 fps option requires that the lens is also capable of reacting very quickly. At this time, they said, only the Lumix X 12-35mm f/2.8 lens is capable of using this mode, and only after a firmware update to be issued later. 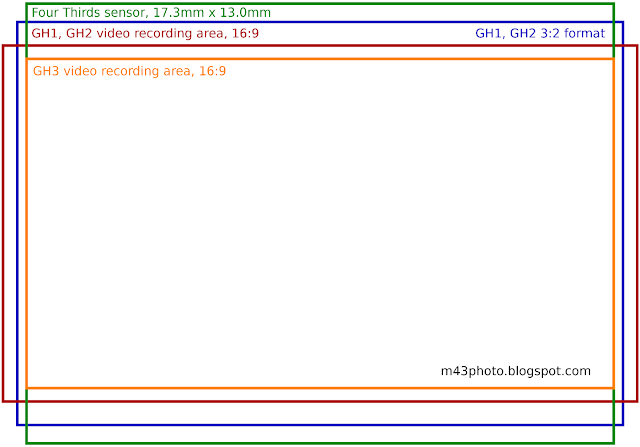 The interview also confirms the rather sad news that the GH3 will not have a multi aspect sensor. Both the GH1 and GH2 had this feature. The multi aspect sensor feature means that the sensor is over-sized. At any one time, the whole sensor area is never used. But various parts of the sensor area can be used, to enable 4:3, 3:2 and 16:9 aspect ratios, while retaining the same diagonal field of view. 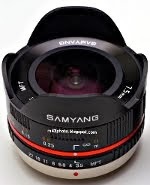 This uses the lens imaging circle more efficiently, especially in video mode. The engineers do not state any reason for dropping this feature, beyond saying that a sensor was not available. With the GH1 and GH2, I guess that they had separate production runs for these camera sensors, even though they were not volume models. This must have been an expensive sensor to make, relative to the volume of the cameras. The GH3, costing even more than the predecessors, will probably not become a volume model, either. So I am guessing the reason is economics: It will be too expensive to order special production runs for this single camera model, and they think this extra cost is not worth the benefits of the multi aspect sensor. I would say this is consistent with the LX5 and LX7 premium compact camera models. The LX5, launched in 2010, had a sensor slightly larger than the common 1/1.7'' size, to accomodate the multi aspect feature. The LX7, launched in 2012, on the other hand, reverts to the usual 1/1.7'' sensor size, probably to make the sensor production cheaper. 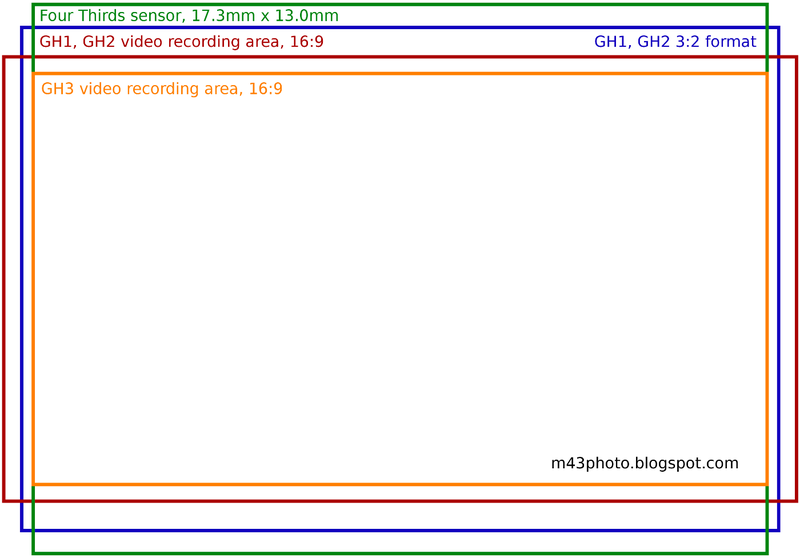 Producing sensors in odd sizes (as with the GH1, GH2 and LX5) is certainly more expensive than common sizes. On the other hand, the LX7 does retain the multi aspect sensor feature, but now with a smaller total image circle, so that it still fits into the common 1/1.7'' sensor size. I have written more about the Multi Aspect Sensor here. As you mention in your post, this is not a normal sensor shape, so it is easier for camera makers just to crop a 4:3 or 3:2 shaped sensor. Applying an 1.45263 aspect ratio crop to 4:3 gives you 92% coverage, vs. 97% coverage on a 3:2 aspect sensor. Thus, a 3:2 sensor is a better candidate for multi-aspect. Interestingly, the 1" sensor on the Sony RX100 is 3:2. An LX7-ish camera with a 1" multi-aspect sensor would be really interesting. It is perhaps not unexpected that the 3:2 format is better for multi aspect. After all, the 16:9 is a rather wide format, much wider than 4:3. All this talk about the missing multi aspect on the GH3 is perhaps a bit over exaggerated, as no other interchangeable lens camera system has this feature. The multi-aspect feature is cool, but perhaps not as beneficial in real terms as users perceive it to be. Multi-aspect maximizes the utilization of the lens area over that of the sensor area. If the sensor is the cheaper component, then multi-aspect makes sense. So much sensor area is underutilized in this case, that a sensor almost as big as m43 would give you performance slightly worse than a 1" sensor -- not worth it. Thanks for posting the video and breakdown of the aspect ratios! I think I'll be sticking with my GH2 for a while!